Blackhat goes very digital with a lengthy (re: boring) opening number that glides and flows through the circuitry of computer hardware and the glowing fiber stuff of the Interwebz as an anonymous hacker infiltrates a Chinese nuclear power plant and causes a meltdown. 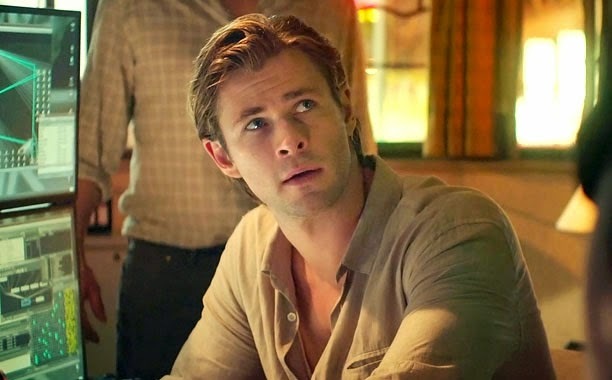 Cue Yankee techno-whiz/inmate Nick Hathaway (Rush's Chris Hemsworth, who's okay here but nothing more) who becomes the last line of defense for FBI agent Barret (an effectively cast Viola Davis and her ally from the Chinese government Chen Dawai (Leehom Wang). Hathaway cuts a deal using a refreshingly scant amount of jargon (one doesn't need to be tech savvy in order to see Blackhat) and pretty soon he's out of prison and leading a whipsmart team on a globe-trotting cat and wireless mouse chase. What all this has to do with digital, though, is how prominently the techno current of Blackhat both works in the film's favour and against it. Digital cinematography works best when one doesn't really notice the disparity between digital and film--and the prominence of digital projection nowadays often makes the difference in mediums visually imperceptible--but it rarely caters to the theatrical film experience when the aesthetic shoddiness of digital overrides the frame. Blackhat marks itself with this digital divide because Mann, working with DP Stuart Dryburgh, once again offers some terrific, bleak, and gritty imagery using the coarse grain and mucky exposure of pixels. Blackhat looks like cutting-edge techno-trouble whenever the gaudy artificial lights of the nocturnal cityscapes use light pollution and low-res imagery to great effect. Blackhat, especially in its arresting night scenes, envisions a contemporary world stuck in a choke chain as civilization finds itself pulled back and forth in the pros and cons of technology. In this case, though, as it often is with the realm of the digital, the nay side wins. Sure, Blackhat has a clean, positive, and overall optimistic ending, but the film itself makes it seem as if filmmakers, or at least Mann, still haven't quite figured out how to make a film without using any film. Blackhat suffers the effects of its digital renderings particularly poorly in the daytime scenes and virtually all the interior shots, which look like amateur time-constraint film challenge stuff, and in the choppy action sequences that render themselves incoherent and nauseating with their dizzying frame rates. Blackhat looks great one moment and then terrible the next as if Mann tries to emulate the aesthetic of Collateral using the same camera with which he shot the film a decade prior. For a film so on the pulse of technology, Blackhat often finds itself stifled by technology. Blackhat boasts a screenplay that is equally choppy, like a YouTube video struggling to buffer with a slow connection. A slow start makes way for an engaging midsection in which Hathaway, Barret, and company mix compu smarts with maverick detective skills, and the film moves into a smart, slick thriller with a resonant story about the digital divide that separates cops and criminals, for hackers working outside the law work more quickly than compucops bogged down by bureaucracy and the law. (One latter act rogue move by Hathaway and Barret conveys this sense quite effectively.) Similarly, the globe-trotting scope of the film, coupled with its notably diverse cast, evokes the interconnectedness of cyber crime and its solutions. Blackhat, however, struggles with an ineffective and unnecessary romantic subplot between Hathaway and Chen's sister Lien (Tang Wei of Lust, Caution fame, making the best of a ho-hum role) that frequently brings the film to a grinding halt. Blackhat also feels crazily uneven since it punctuates the static of the love story with aberrant action sequences and gratuitous violence. The unwieldy finale set in a giant parade reeks of exoticism and Michael Bay-ishness, and the awkward digital incoherence only madness the film on a more unsatisfying note. Add an ungodly body count and Blackhat feels more like a virus than cutting edge hardware by its end. Ironic, isn't it, that Blackhat seems obsolete in comparison to a gray-haired Tom Cruise movie from a decade ago. Blackhat is now playing in wide release.